Located in Centerville, Iowa, Centerville Greenhouses & Landscaping is a year-round wholesale plant grower serving Iowa, Missouri & Illinois. It also offers Landscape & Hardscape design to Southern Iowa & Northern Missouri customers. 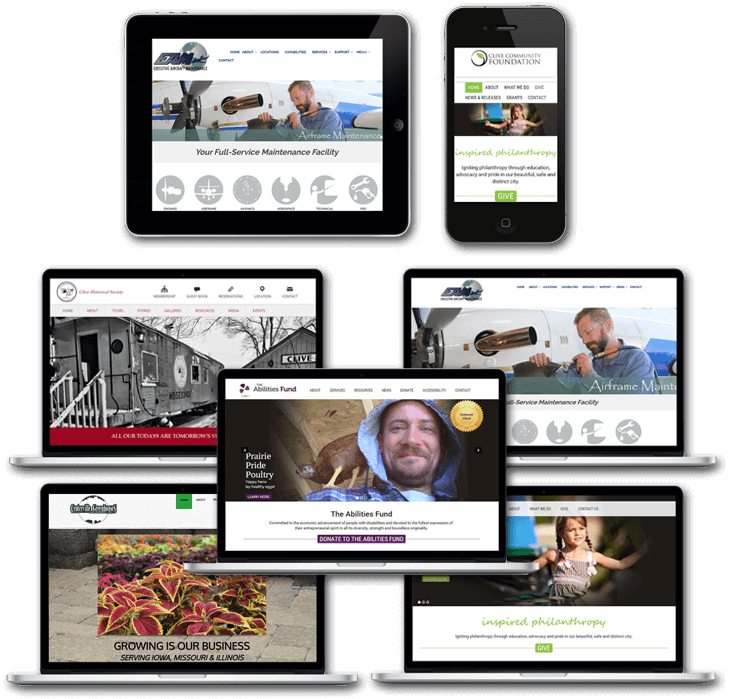 Website Requests: Photo galleries highlighting their broad array of wholesale plant products and landscape services, mobile-ready, contact form, map, organic search engine optimization. Glendale Aero Services provides Aircraft Fuel, Maintenance, Parts & Ground Support at the Glendale Municipal Airport in Glendale, AZ. Website Requests: Display the latest information on FBO services offered, mobile-ready, electronic contact form, google map, organic search engine optimization, redirect & map old website links to corresponding new website links. RAW Metal Works is a Centerville, Iowa, Custom Metal Fabrication Firm Specializing in: Railings, Metal Decor & Welding. Website Requests: Photo galleries highlighting their depth of products and services, responsive (cell phones, tablets, desktops), integrate social media, contact form, map, organic search engine optimization. SmartClean™ Cleaning & Maintenance is Central Iowa’s Green Cleaning Solution for your Office or Commercial Space. SmartClean™ is the only cleaning company in Iowa to achieve 100% CIMS Green Building Certification! Website Requests: Thorough explanation of commercial/janitorial services and ‘green clean’ quality designations. Mobile-ready, integrate social media, contact form, map, organic search engine optimization, customized User Guide & training.